Although a number of baseline factors are predictive of response to treatment of chronic hepatitis C infection, HCV genotype is the strongest and most consistent predictor for achieving a sustained virological response. In the large clinical trials of combination therapy with IFN and ribavirin, only 30% of patients infected with genotype 1 had a sustained response compared to 65% of patients infected with genotypes 2 or 3.51,52 Too few patients infected with genotypes 4, 5, and 6 were included in the clinical trials to adequately assess the likelihood of therapeutic response with these genotypes. In practice, HCV genotype can be used in tailoring the duration of therapy to individual patients. In an algorithm proposed by Poynard et al.,44 the five independent predictors of sustained virological response are considered at the end of 24 weeks of combination therapy. The predictors of sustained response are HCV genotype other than 1, viral load of <2,000,000 copies/ml, age <40 years, female gender, and no or only portal fibrosis on liver biopsy. If HCV RNA is still detectable in the serum at the end of 24 weeks of therapy, then the patient is unlikely to benefit from an additional 24 weeks of IFN and ribavirin, and therapy can be stopped. However, if the HCV RNA is undetectable after 24 weeks of therapy and the patient has fewer than four favorable factors, then therapy should be continued for an additional 24 weeks since these patients may obtain benefit from additional therapy. Conversely, therapy can be safely stopped if the patient has four or five favorable factors and is HCV RNA undetectable at 24 weeks. 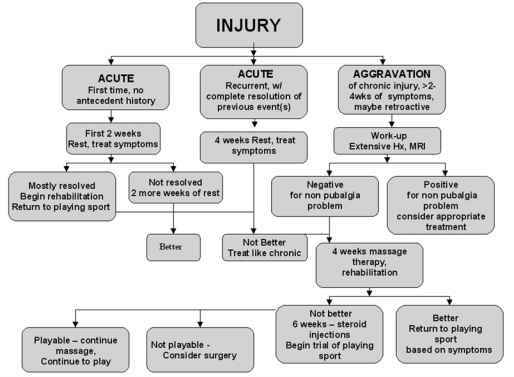 This algorithm ensures that only those patients who may benefit from 48 weeks of therapy have to endure it. sensitivity-determining region (ISDR). The same group recently confirmed and extended their observations. They found that sustained response rates correlated with the number of mutations in the ISDR with a larger group of patients and identified the mutation sites within the ISDR that were significantly associated with sustained response.62 Although these results have been confirmed for Japanese isolates, in studies of patients from other countries the majority of IFN-sensitive isolates showed no or only a few mutations in the ISDR.5,63,64 The reasons for the different findings are not clear but may involve racial, viro-logical, or other factors.